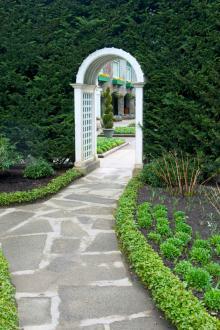 Making use of vertical space is one of the keys to a gorgeous landscape design. Trees, trellises, obelisks - even birdhouses - are all ways to transcend two-dimensional gardening and take your landscape to another level. 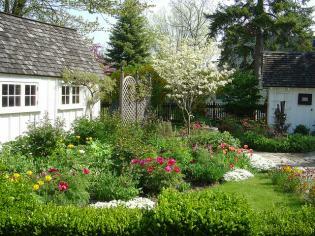 Planting a tree, vine, or large shrub is the most straightforward way to add height to the landscape. Of course, you will have to wait awhile for the plants to grow, but a mature multi-storied planting creates a dramatic park-like atmosphere that is the stuff of garden magazine photo shoots. 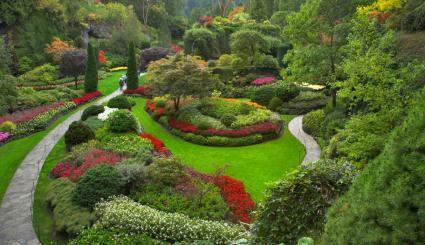 A single specimen tree or large shrub amid relatively low-lying vegetation will create a focal point, drawing the eye. A forest-like planting that includes numerous trees can form a canopy over a larger area, under which shade-loving species can be planted. Hedges comprised of closely spaced shrubs form a continuous wall of vegetation, which is useful as a visual barrier. The hedge approach, on the other hand, is a way to draw a line in the landscape and give it height to maximize its visual impact and purpose as a barrier. A number of different plants and methods can be used when considering how to incorporate the approaches into your own yard. Take what you need from these examples to make it work in your landscaping. A good rule of thumb is to plant single specimens about twice as far from the point where they will be most often viewed as the expected mature height. Thus, a dogwood tree that grows to 20 feet should be about 40 feet from the door, if it is to be planted in the front yard. This principle gives a good reference point for selecting specimens that are proportional to the size of the space where they will be planted. It should be an exceptionally beautiful tree, whether a stately oak for shade or a flowering saucer magnolia for its unbeatable spring display. If the specimen is not in a lawn, plant masses of groundcover to cover the area under the canopy, being sure to use shade-tolerant plants, like vinca, Solomon's seal, dead nettle, monkey grass, lily turf or Christmas fern. The rules for specimen plantings can be disregarded for the forest garden approach. Instead, plant the trees roughly 15 to 20 feet apart in a grove of at least five individuals. Birches, pines, maples, redbuds, black locusts and other species that grow significantly taller than wide are the best candidates for this approach. Unlike the mass plantings under a shade tree, these will be viewed from up close, as this type of garden is meant for strolling through. Map out a path with bender-board edging and lay mulch, crushed granite, flagstone or concrete stepping stones as a surface. Fill in the areas closes to the path with a mix of small shade-lovers like violets and columbine. Farther back, plant larger forest perennials, like Japanese anemone, and then create a varied backdrop with shrubs like azalea, camellia, rhododendron and daphne. Hedges are much more straightforward and are generally chosen for the practical purpose of creating a visual barrier and/or a backdrop for the landscape. Bamboo is good choice for a fast-growing hedge, though most species will spread if a rhizome barrier is not installed. Otherwise, any shrub, from holly to hydrangea, is fair game for a hedge. You can choose an approach with straight lines or create a curved, meandering hedge, depending on what would fit best with the existing garden layout. Hedge shrubs are usually planted no more than four feet apart, so they will quickly grow into a solid, impenetrable mass. If you've inherited a flat, dreary yard with the home you bought, don't feel like you have to be wed to it for life. Moving around the soil to create visual interest is not a far-fetched idea - landscape contractors do it all the time and is it one of the secrets to a lush and beautiful landscape. You can create a long planting berm (a low, broad elongated mound) that wraps around two sides of the yard and plant it with a mix of trees, shrubs and perennials to create a sense of enclosure and privacy around the lawn. On larger lots, a series of hills and dales, with taller species on the mounds and drifts of reeds and ornamental grasses in the low-lying parts, is a pleasing juxtaposition to adjacent flat areas. 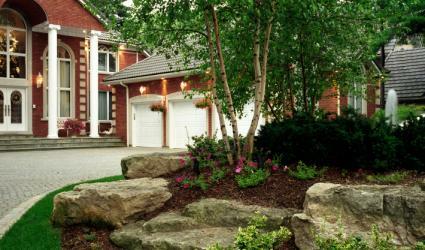 Incorporating stone is a great way to hold up the soil and add further visual interest. This can be accomplished on a small scale by digging basins six or eight inches deep and using the excavated soil to create mounds and berms in an artful way. It sounds like a lot of work, but digging just six inches and piling the soil in an adjacent mound creates a one foot elevation difference, which can feel quite dramatic compared to a flat landscape. There are few limits when using grading to re-invent your landscape, but you'll probably want to call a landscape contractor who can do the work with heavy equipment to help you create the landscape of your dreams. Be sure to call 811 before you dig to have underground utilities marked and plan your grading project around them. Climbing, flowering, and fruiting vines are a quick way to add height to the landscape, but they need a structure to grow on. A structure can also be used on its own to create vertical interest. A trellis is any structure that is intended to support a vine. It can be as simple as three bamboo poles lashed together to form a bean tipi (a tall, narrow pyramid-like trellis that is useful for any annual vine) or as elaborate as an ornate wrought iron structure that can support the weight of large woody vines, such as grapes or wisteria. Trellises are typically used against a wall or in the middle of a flower or vegetable bed. 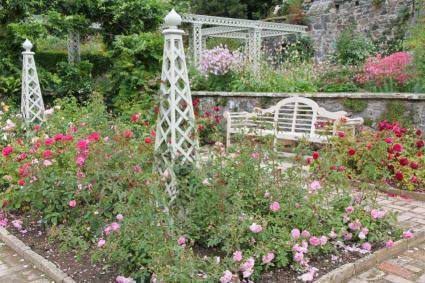 An arbor is a trellis that goes over a walkway and is typically used at the entrance to a garden area. Arbors are often incorporated with other vertical elements that divide one space from another, such as a fence or hedgerow. A pergola is like an extended arbor. 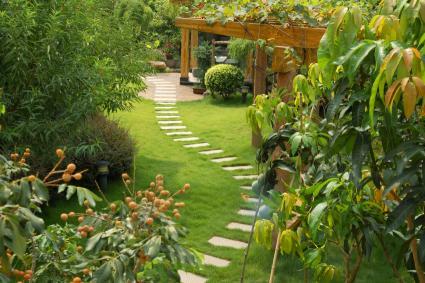 They can be designed as a tunnel that extends to cover a pathway or as a shady destination in the garden, similar to a gazebo, except that the roof is open to the rain. A simple birdbath or sundial mounted on a pedestal creates height in a small way, while a garden windmill accomplishes the same effect on a grand scale. In between are obelisks, a general name for a garden monument that is used for aesthetic purposes. These are a natural focal point for the center of a bed, at the top of a mound, or off in the distance in one corner of the yard. Choose one approach and stick with it - combining multiple vertical elements of different types in the some space creates a cluttered look. Repeating the same style is generally effective, especially in groups of three - three shade trees in a grove, for example. Think proportionally - if you have a small yard and low slung house, you'll want to use a different scale of vertical elements than with a three-story mansion. Adding a vertical component to flat space is one sure way to make it more interesting. Whether you're planning a grand terraced garden or just adding a simple trellis, following basic design principles of balance, proportion and repetition will make it come off as a seamless, natural-looking addition to the landscape.